This traditional house plan features a three car garage, angled keeping room and master suite upstairs. Adjacent to the two-story foyer is the dining room and the study. The spacious grand room draws you in with a coffered ceiling and fireplace. The large kitchen in this luxury custom home includes a bar area and tons of counter space ideal for entertaining. Attached to the kitchen are the morning room and our signature angled keeping room. The main floor also has a bedroom with full bath. The second floor is equipped with three additional bedrooms and media room. The master suite on this second floor is spectacular with a trey ceiling, sitting room and over-sized walk-in closet. 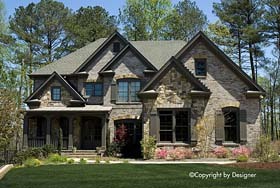 We offer floor plan modifications on all of our traditional house plan designs. Question: Are there any available pictures of the inside of this plan? Answer: Unfortunately, we do not have any interior photos of this home. Click Here to download a free PDF Brouchure of Plan Number 97627.